Over the last few weeks, we’ve been celebrating diversity, equality and love across the business, as well as across the nation, through a variety of celebration events. As presenting partner of LGBT 50, celebrating 50 years since the decriminalisation of homosexuality began in the UK, we wanted to spread the word about equality and diversity in business. Our flags flew high across Sewell on the go’s retail sites, our newly wrapped vans carried the message across the region and our head office décor shouted it loud and proud. Looking back on how the business has evolved in the last fifty years, Paul Sewell, Managing Director, said: “We’ve gone from black and white in 1967 to technicolour in 2017 and we’re proud to be at this point. Five decades flash by in an instant, but so much progress has and can still be made. “When I first started at Sewell Group, it would have been about how much the pay was and a job description. Now, people want to know the company is doing the right thing. No matter what their backgrounds are, our staff have the freedom to be creative and explore new opportunities. “LGBT 50 is a hugely significant milestone to celebrate and we were incredibly proud to be chosen as the Presenting Partner and to link our brand with a forward-thinking and kind approach to life. 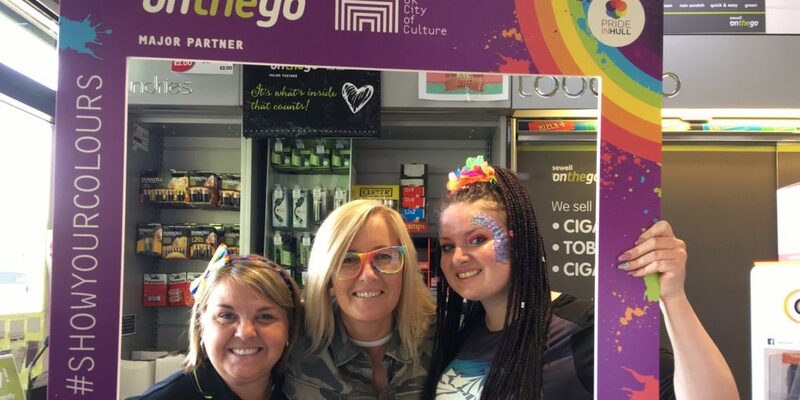 Staff here at Sewell Group threw themselves into the celebration of LGBT 50, spreading colour and joy across the city with our ‘Show Your Colours’ day on Friday 21st July. From rainbow cakes to jazzy attire and a special talk from Pride in Hull Vice Chair, Andy Train, it was certainly a day of colour and team spirit. In the evening, our leadership challengers were all hands on deck to paint seven sets of steps in Queens Gardens, in preparation for Pride in Hull. Visited by 9000 people over the Pride weekend, the rainbow coloured steps were widely recognised and lead the way for each and every person visiting the area over the weekend. However, the highlight of the celebrations came from Facilities Manager, Craig Hancock, who became our star performer as he took to the stage with representatives from Pride in Hull, the armed forces and the emergency services, for a rendition of the classic LGBT+ anthem, Y.M.C.A. Overall, the last few weeks have been a brilliant and proud time for everyone at Sewell Group. Sales Assistant Stuart Aldus, who has worked for Sewell on the go for more than 15 years says he’s extremely proud to work for the company.